Heenan, P. B. 1996. A taxonomic revision of Carmichaelia (Fabaceae - Galegeae) in New Zealand (part II). New Zealand Journal of Botany 34: 157-177. I have a suspicion that New Zealand does not have one of the most diverse floras by world standards overall. However, one can't help noticing that within the New Zealand flora, certain genera seem to make up disproportionate numbers of species. Genera such as Hebe (ermmm... Veronica?) and Coprosma seem to have undergone speciation explosions and can be found almost anywhere you'd care to go. With a little over twenty species, the New Zealand brooms of the genus Carmichaelia (C. flagelliformis shown above, from Wikipedia) are not quite in Hebe league, but still represent a quite respectable little radiation. Except for a single species on Lord Howe Island between New Zealand and Australia, the Carmichaelia species are restricted to New Zealand. In the past a number of smaller genera of New Zealand brooms were recognised in addition to Carmichaelia, but phylogenetic analysis indicates that these groups are nested within Carmichaelia (Heenan, 1998), so they have no all been synonymised with the larger genus. Unfortunately, a significant number of Carmichaelia species are endangered or vulnerable, as they seem to favour habitats that are prone to human disturbance. Prior to Heenan's work in the mid-1990s, Carmichaelia taxonomy was a bit of a mess. More than fifty species had been named at one time or another, mostly from individual collections. Heenan seems to have conducted something of a slash-and-burn, reducing the number of species from over fifty to seventeen (Heenan, 1995, 1996). When studied at more of a population level, some of the Carmichaelia species turned out to be decidedly variable - the extreme being Carmichaelia australis, which swallowed up some twenty-five synonyms, showing noticeable variation in seed and seed-pod size, shape, colour and growth habit. In the latter case, Heenan demonstrated that this represented true intra-specific variation rather than lumping of different species under one name by examining a single population in Canterbury along a transect of 150 metres, and showing that variation in seed-pod size and shape in the one population was as great as in the population as a whole. 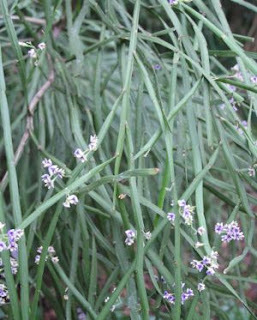 One population of C. australis had previously been described as a separate species due to its spreading growth habit, rather than erect as in other populations - however, when plants from this population were grown in cultivation they adopted the erect habit of other C. australis, indicating that the habit found in the wild was due to environment. Variation in Carmichaelia australis seed-pods from a single population in Port Hills, Canterbury (from Heenan, 1996). The biogeographical implications of Heenan's work are rather interesting. While C. australis, for instance, is found almost throughout New Zealand, other species have exceedingly restricted ranges. I've spoken before (see here and here) on the phenomenon of restricted soil types resulting in equally restricted plant species, and Carmichaelia provides more examples. The prostrate C. appressa, for instance, is restricted to sandy soils and dunes on the Kaitorete Spit in Canterbury. 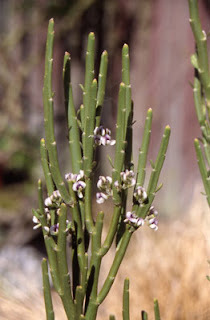 Heenan suggests that C. appressa may represent a segregate from C. australis (from which it differs only in growth habit and the colour of its cladodes [photosynthetic stems]) that has adapted to the different soil, and phylogenetic analysis (Heenan, 1998) does place C. appressa as the sister to C. australis. Heenan also records two other populations from different localities in Canterbury that are very similar to C. appressa, but refrains from actually assigning them to that species, alluding to the possibility that these may prove to be independent segregates from C. australis that have convergently developed the characters of C. appressa in adapting to similar habitat. Carmichaelia hollowayi (shown at left in a photo by John Barkla from New Zealand Plant Conservation Network), in contrast, is restricted to limestone soils, and is known from only three outcrops of the Otekaike limestone in northern Otago, with very low numbers at each site. Heenan (1996) recorded that the largest of the three populations numbered about 45 individuals, while the smallest contained only three. Seedlings or young plants were not found at any site, and appeared to be excluded by introduced pasture grasses and weeds. Still, some aspects of Heenan (1996) just scream out for further research. I've already mentioned the C. appressa conundrum. Another species, C. odorata, exhibits what Heenan interprets as a clinal variation across its distribution from north to south, but an uninhabited band through central Nelson divides its distribution in half. Are the northern and southern populations taxonomically distinct? Heenan points out that while the range of variation in each population is distinct, some overlap occurs. I've also already referred to changes in growth habit due to environment in C. australis. Carmichaelia petriei also shows variation in growth habit, with both erect and prostrate forms in the wild. Cuttings of the prostrate form taken into cultivation develop the erect habit, arguing against taxonomic distinction and suggesting the prostrate habit is environmentally induced. However, the same area in the wild may contain both prostrate and erect individuals, so what is going on? Has the prostrate form only evolved recently, and potentially-prostrate individuals have not yet displaced obligately-erect individuals from prostrate-favouring habitat? Finally, I can't help feeling that a re-division may still occur of C. australis. While some features such as pod size and shape have been shown to vary within individual populations, others such as cladode form do still vary geographically. Heenan refers to research by Purdie (1984) that identified geographical variation in flavonoid chemistry in what would become C. australis (but then represented multiple species). This is interesting, as flavonoid chemistry has some taxonomic significance in other plants (e. g. Bayly, 2001). However, Purdie did not provide voucher specimens of the species he used, reducing the taxonomic usefulness of his results (the variation did not fully match up with species boundaries as recognised at the time). One more example of the extreme importance of providing voucher specimens in any ecological study! Bayly, M. J., P. J. Garnock-Jones, K. A. Mitchell, K. R. Markham & P. J. Brownsey. 2001. Description and flavonoid chemistry of Hebe calcicola (Scrophulariaceae), a new species from north-west Nelson, New Zealand. New Zealand Journal of Botany 39: 55-67. Heenan, P. B. 1995. A taxonomic revision of Carmichaelia (Fabaceae – Galegeae) in New Zealand (part I). New Zealand Journal of Botany 33: 455-475. Heenan, P. B. 1998. Phylogenetic analysis of the Carmichaelia complex, Clianthus, and Swainsona (Fabaceae), from Australia and New Zealand. New Zealand Journal of Botany 36: 21-40. Purdie, A. W. 1983. Some flavonoid components of Carmichaelia (Papilionaceae) — a chemotaxonomic survey. New Zealand Journal of Botany 22: 7-14.